Matt Gregoire | Vision Research Park, LLC. Matt grew up in Devils Lake, ND. He has a degree in crop and weed science from North Dakota State University. He was a precision ag specialist with Precision Ag Results for five years, responsible for crop consulting, soil sampling and variable rate prescription mapping. 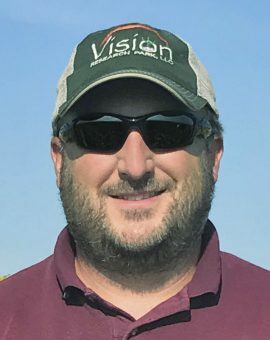 Matt started working as a precision ag specialist for Vision Research Park in 2012 and also works as a crop consultant and assists with research endeavors. Matt has 11 years of experience working in north, central and northwest North Dakota on a variety of crops and cropping systems.